iOS 10 GM is now available to download for all users who have participated in the iOS 10 public beta and iOS 10 developer beta testing programs. The iOS 10 GM seed will download and install on any iPhone, iPad, or iPod touch device that is supported by iOS 10 and should be considered the final version of iOS 10. 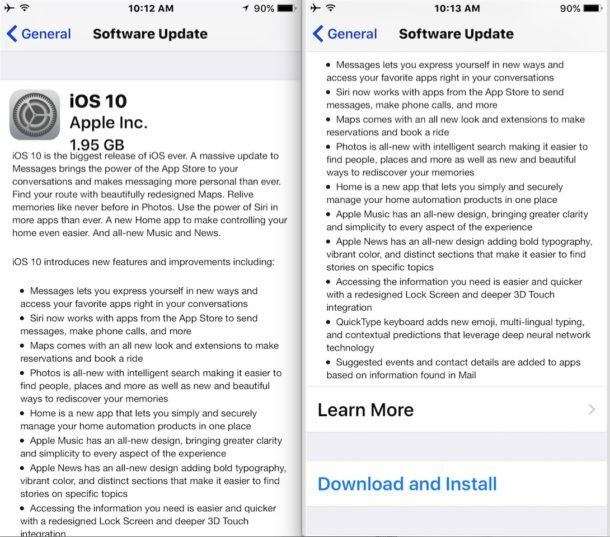 Users who are currently running any iOS 10 beta release can find the iOS 10 GM build available to download right now in the Software Update section of the iOS Settings app. 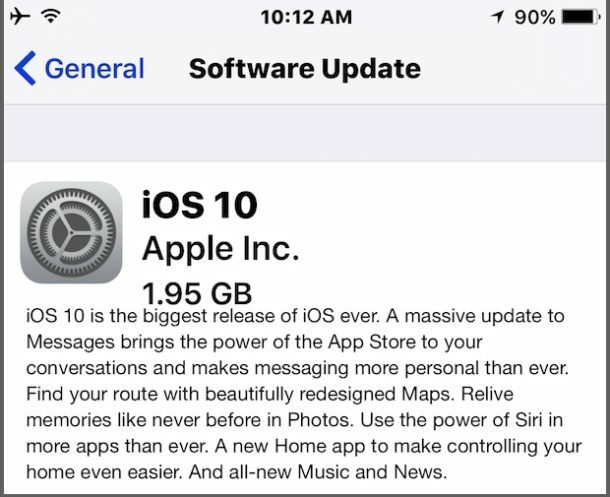 The iOS 10 GM build download is about 2GB and requires a bit more space to complete installation on iPhone and iPad. As always, backup a device before installing any system software update. Any user can choose to participate in the public beta program, meaning nearly anyone can download and install iOS 10 GM right now. Be sure to backup your device and check the iOS 10 compatibility list before attempting to do so. 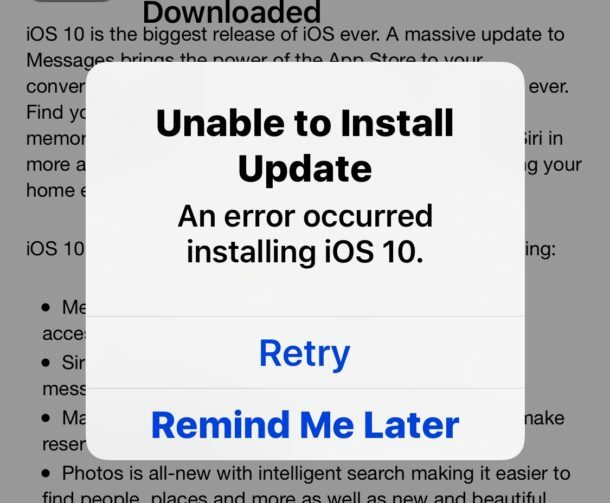 Some users are getting an “Unable to Install Update – An error occurred installing iOS 10” error message with a Retry and Remind Me Later button. If you see this error, be sure the device has maintained a wi-fi connection and has adequate battery, then use the Retry button on several occasions to resume the installation. If the “Unable to Install Update” error message persists, free up additional space on the iPhone or iPad. Anecdotally, the download itself requires about 2GB and there needs to be another 1GB or so free in order to install the update successfully. Why is it called iOS 10 GM? GM stands for Golden Master, which typically indicates the final build in the software development process. The term Golden Master comes from when discs were used to distribute software, where the final version of software was dubbed the ‘golden master’ build to be sent for mass production and distribution. These are also sometimes called RTM or Release To Manufacturing builds. Thus, this final build of iOS 10 is dubbed the iOS 10 GM build, meaning absent any unforeseen major problems, the iOS 10 GM release will be the exact same version that is released to the general public soon after. Similarly, macOS Sierra GM is out to download now for all beta testers as well. The final version of iOS 10 will be released on September 13 to everyone in the public, meaning all users who are not actively in the beta program. Ha, that’s one of the most unappealing update summaries I’ve ever read from Apple. I wonder what most people are going to think of the new lock screen… and Messages…. I wonder if we can disable voice command. It is so annoying.